There was sort of inevitability about last Saturday, even if only liars predicted the scoreline. Everyone loses at home eventually and it had been almost a year since Sunderland were beaten at the Stadium of Light. It was four months since they had lost at all. We knew that the little club would be more enthused than normal by their trip to the big club. This happens regularly. But for me the inevitability stems from the previous Saturday, when Jack Ross’ lads won at Rochdale while every team that matters came a cropper. Do you ever get the feeling that things are going too well? I do. Sure enough, after the fun at Spotland came the worst set of results since Harry Redknapp’s O-levels. Foremost among those bad results was of course Sunderland’s own. A merely bad day against Burton was followed by a terrible one four days later. It was weird. Despite some comments made after the game, Sunderland do not have a bad defence by the standards of League One, conceding the fourth fewest goals. Not that anyone would realise this from watching on Saturday. As ever, there was no shortage of application. No one hid or shirked. Sadly this wasn’t enough to avert a ruddy awful defensive display, with the midfield being marginally better. There are positives. The most important thing is that their fate is still in their own hands. They must also have done something right because they did score four goals, which would ordinarily guarantee a win. 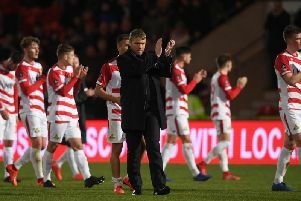 They have still only endured three defeats and have scored in every game except one and, to their credit, none of the players or management has proffered an excuse. They could have pointed out that some of the team were playing their fifth game in 13 days. Saturday was truly a one off. You may never attend another game like it. It was an aberration. An exception. A lottery of a match. If Sunderland fail to achieve promotion this season, then will be more significant reasons for this than one silly afternoon, when the front line of mediocre-at-best opposition was allowed to do virtually whatever they pleased. The biggest reason for the precarious situation – and everybody knows it – is too many draws. Seventeen so far and the most in the league. More specifically, seven of those draws came after they had taken the lead. Too rarely do they take a two-goal lead and prevent widespread indigestion among their supporters: even when they win. So let’s put the freak show to one side and concentrate on the next match: Doncaster Rovers on Good Friday. It’s all you can do. The fans were pretty quiet last Saturday. This was due to a combination of Sunderland never taking the lead and an insipid visiting club who, let’s be honest, don’t arouse much interest in their own city, never mind anyone else’s (in fact they may soon be cancelled due to lack of interest). Onwards and hopefully upwards then. Forget what happened in the previous game and crank it up on Friday. It’s a 5.15pm kick-off, which should help create a more rambunctious atmosphere as it facilitates another two hours in the pub. If it turns out to be a boring game, then let it be a boring home win. We’ve had enough “entertainment” for the time being.